One of England's leading "goth" bands of the 1980s, the Sisters of Mercy play a slow, gloomy, ponderous hybrid of metal and psychedelia, often incorporating dance beats; the one constant in the band's career has been deep-voiced singer Andrew Eldritch. (There is some disagreement as to whether the group took its name from an order of Catholic nuns or from the Leonard Cohen song of the same name.) Eldritch originally formed the band in 1980 with guitarist Gary Marx and recorded its first single with a drum machine dubbed Doktor Avalanche. Guitarist Ben Gunn and bassist Craig Adams were added to make live gigs feasible, and the Sisters built a reputation through several singles and EPs. Gunn left the band in 1983 and was replaced by Wayne Hussey. 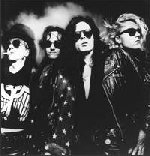 The Sisters of Mercy recorded their first full-length album, First and Last and Always, in 1985, but two years later, internal dissent had split them apart; Marx left to form Ghost Dance, and Adams and Hussey departed shortly thereafter. A legal dispute ensued over the rights to the name Sisters of Mercy; Adams and Hussey attempted to use the name Sisterhood, but Eldritch released an EP under the name to prevent its usage, and the two finally settled on the Mission. Eldritch chiefly utilized a corps of temporary sidemen from this point on (although former Gun Club bassist Patricia Morrison was an official member of the group for a short time) and rebounded with his two biggest-selling American LPs, Floodland and Vision Thing. He is currently the group's only member.